Ignorance Made Us Hungry: This Is Capitalism. I just had the unique experience of being excited, inspired, and disgusted all at the same time. David Foster Wallace is the author of the novels Infinite Jest and The Broom of the System and the story collections Oblivion, Brief Interviews with Hideous Men, and Girl With Curious Hair. His nonfiction includes the essay collections Consider the Lobster and A Supposedly Fun Thing I'll Never Do Again, and the full-length work Everything and More. 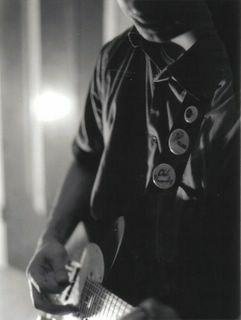 He died in 2008. Only once did David Foster Wallace give a public talk on his views on life, during a commencement address given in 2005 at Kenyon College. The speech is reprinted for the first time in book form in THIS IS WATER. How does one keep from going through their comfortable, prosperous adult life unconsciously? How do we get ourselves out of the foreground of our thoughts and achieve compassion? The speech captures Wallace's electric intellect as well as his grace in attention to others. After his death, it became a treasured piece of writing reprinted in The Wall Street Journal and the London Times, commented on endlessly in blogs, and emailed from friend to friend. This commencement speech, prominently displayed in a university bookstore, is supposed to dole out little nuggets of wisdom to graduating seniors. I wonder if any of the parents who end up buying their children this book will read it. I wonder if any of them knew who David Foster Wallace was. I'll admit that I don't know too much about the man, but I've read a few essays by him --- enough to convince me that he would not take kindly to this sort of release. Why not hold off until a collection of his unpublished work comes out and add it to that? Or add it to a biography of him that comes out? This seems like a sick attempt to cut a profit from Wallace, who was a great writer. I was excited to see another piece of his work getting published, but I was disgusted when I realized that I could have easily found this online. In fact, it was the first link delivered from a simple Google search. The saddest part is that Wallace mentions suicide in his speech, and there is no mention anywhere in or on the book that he himself eventually succumbed to it. Wallace was expanding on the claim that college is supposed to "teach you how to think." He mentioned the mundane existence of day-to-day adult life driving around in traffic and going to the grocery store. He said that college really just tries to teach you what to think about, and how to control your own thoughts about things to stop you from going crazy. I think the publisher owed it to the audience to mention that Wallace committed suicide after a long struggle with depression. It's grotesque, yes, and it may be uncouth to mention in the author bio, but it's an important aspect of him that gives more meaning to his words. The publisher is trying to get away with a gimmicky release. They're trying to trick helicopter moms into buying this famous graduation speech from this famous writer. How could anyone have thought this was a good idea? David Foster Wallace, whose prodigiously observant, exuberantly plotted, grammatically and etymologically challenging, philosophically probing and culturally hyper-contemporary novels, stories and essays made him an heir to modern virtuosos like Thomas Pynchon and Don DeLillo, an experimental contemporary of William T. Vollmann, Mark Leyner and Nicholson Baker and a clear influence on younger tour-de-force stylists like Dave Eggers and Jonathan Safran Foer, died on Friday at his home in Claremont, Calif. He was 46. A spokeswoman for the Claremont police said Mr. Wallace’s wife, Karen Green, returned home to find that her husband had hanged himself. Mr. Wallace’s father, James Donald Wallace, said in an interview on Sunday that his son had been severely depressed for a number of months. 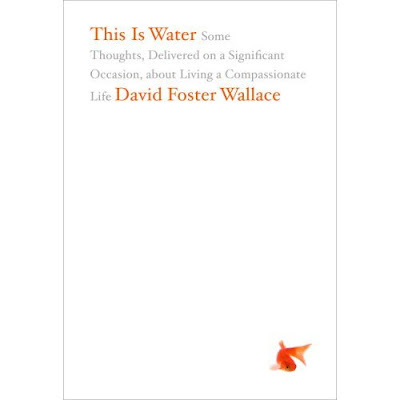 ("David Foster Wallace, Influential Writer, Dies at 46"
"The speech is reprinted for the first time in book form in THIS IS WATER." This is somewhat deceptive. It means literally "This is the first time this essay has been released as a standalone book," which could also mean "This is the first edition of the reprint of this essay." Could you imagine the first time that a book was released where it said "This is the first time anyone ever published this as a book. It existed as manuscripts for a long time, but we were first!!!" I only bring this up because between the time I posted and now, I discovered that this commencement speech was included in the Best American Nonrequired Reading for 2006. The Best American series is a massively available series. This just adds to the idea that Little, Brown is trying to cash in big time on this little book --- this essay was already printed in a book. In case you're interested, here is the reprint of this essay in the Wall Street Journal. A piece of peace, please. Responses to Wilco's "Ashes of American Flags."